Ferrel Jacobs, 93, of Crossville, IL, died Friday, February 01, 2019 at Premier Health Care of New Harmony in New Harmony IN. She was born May 3, 1925, in White County, IL, the daughter of Thomas and Rhoda Guinn. She was married to Roll B. Jacobs and he preceded her in death 1984. Ferrel was a homemaker and worked alongside her husband on the family farm. 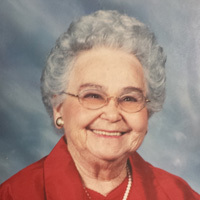 She was an active and faithful member at different times of both Crossville Missionary Baptist Church and the Church of Christ in Crossville. After her husband’s death she enjoyed working cleaning the post office in Crossville, and took pleasure in helping several people cleaning their homes and hosting dinners for her family and friends. Survivors include daughter Patsy (Tom) D’Amico of Lynnville, IN; daughter-in-law Ruth Yates; sons Glenn (Carla) Jacobs of Calvin, IL and Charlie (Kim) Jacobs of Carmi, IL; grandchildren, Stephen Michels, Eric (Melissa) Michels, all of Evansville, IN, Brian (Cheryl) Michels of Gillette, WY, Michael (Ashley) French of Carmi; Rebecca Fishback, Owensville, IN and Tyler Jacobs of Carmi; great grand daughters Ali Michels of Gillette, Stephanie Claborn and Emma Michels, both of Evansville, Madison and Morgan French of Carmi, Elana Fishback Owensville; and great grand sons Dean Michels of Evansville, Mason French of Carmi, and Liam Fishback of Owensville; great-great grandsons Bo Claborn of Evansville, Philip and Willow Michels, Gillette. She is preceded in death by her parents; husband Roll Jacobs; son Ronnie Yates; grandson Dustin Fishback; sister Susie Guinn; and brothers Sammy Guinn, Gene Guinn and Henry Guinn. Visitation is 5-7 pm, Monday, February 4, 2019, at Cook Funeral Chapel in Crossville. Funeral 10 am, Tuesday, February 5, 2019 at Cook Funeral Chapel with burial following in Stokes Chapel in Crossville.